Dr. J.L.N. Sastry hails from a traditional Ayurvedic family. He is born at Narasapuram (W.G. Dist., Andhra Pradesh) on 06-07-1965. He had school studies at Kakinada (E.G. Dist., A.P.) and passed B.A.M.S. in 1989 from Dr. N.R.S. Govt. Ayu. College, Vijayawada (A.P.) in first class. He completed M.D. (Ay.) in Dravya Guna Speciality from Dr. B.R.K.R. Govt. Ayur. College, Hyderabad in 1998 October. He stood first in A.P.P.S.C. selection (January 1990) and worked as Med. Officer (Ayu.) for Govt. of A.P. in the Indian Medicine &amp;amp;amp; Homoeopathy Dept., (1992-99). Between 1998-99 he acted as Research Projects Coordinator at the Govt. Research Dept. of Ayurveda, Hyderabad. He stood first at the UPSC (1998) and joined as Medical Officer (Ay.) in CGHS, Chennai in June 1999. The author is in recipient of two gold medals from Nagarjuna Univ. (A.P.) for the merit shown during B.A.M.S. (1988). The author presented several clinical and scientific papers at Regional, National and International seminars. He had more than 15 publications in standard journals and also published several articles in newspapers. Author also had given Radio- talks and given guest lectures at various prestigious institutes (both Ayurvedic &amp;amp;amp; Modern Medicine). He published a book 40 years of research in Ayurveda in A.P. (on behalf of grda, Hyderabad) . There is no complete text in English on dravyaguna in accordance with CCIM syllabus. Earlier some attempts were made by H.V. Savnur and Moss in English. Still a comprehensive English text in demand. With this background, the author has decided to prepare a unique text on fundamental concepts of dravyaguna as well as on drugs in English. This will be useful to the under graduate as well as the post- graduate students of Ayurveda. At the same time practitioners and teachers will also appreciate the references and subject matter. This book mainly covers the first paper of Dravyaguna for B.A.M.S. students as per the CCIM syllabus. There are sixteen (16) topics in the syllabus which are divided into two parts (A&amp;amp;amp;B). Each part will cover eight topics. After careful examination of the syllabus, several repetitions were founded by the author. Karma chapter is discussed more elaborately with modern pharmacological actions. Several berbs screened for biological and pharmacological activities are mentioned with relavent references. Research works related to Rasa, Virya etc., are also quoted wherever relavent or necessary. 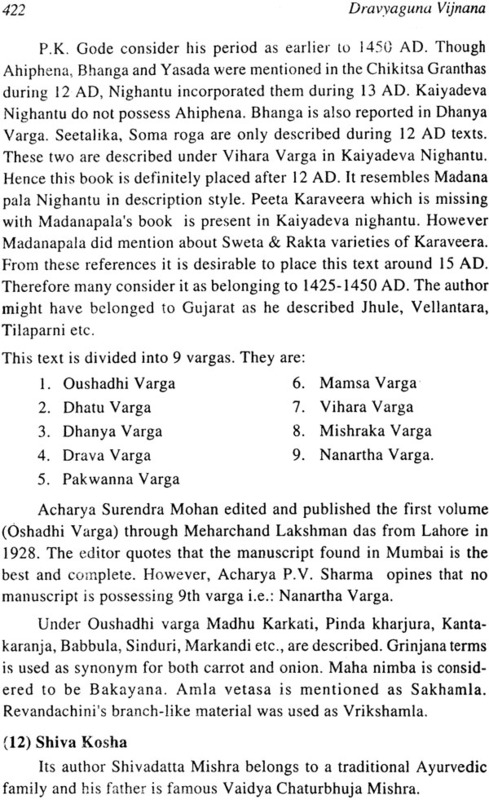 The panchabhoutik aspects of Rasa, Guna, Virya etc., are discussed in respective chapters with scientific background. Overall, the text is meant for every one who is interested to learn about fundamental principles of dravyaguna in Ayurvedda. One can not forget the dictum- “a good physician is a good pharmacologist too”. It clearly indicates that a thorough excellent success in clinical practice to the physician. Ayurveda, the Knowledge of life sciences bestowed health and longevity in the form of preventive and curative measures. ‘Swastha Vritta’ and ‘Sad Vritta’ will cover the preventive aspects of ‘body’ and ‘mind’ respectively while ‘Sodhana’ and ‘Samana’ (curative &amp;amp;amp; palliative measures) drugs are used in the management of different diseases. Except few exceptions the preventive aspects are covered by ‘Adravya Chikitsa’ (treatment without medicaments) and the curative aspects are mainly covered by ‘Dravya Chikitsa’ (Treatment using drugs). 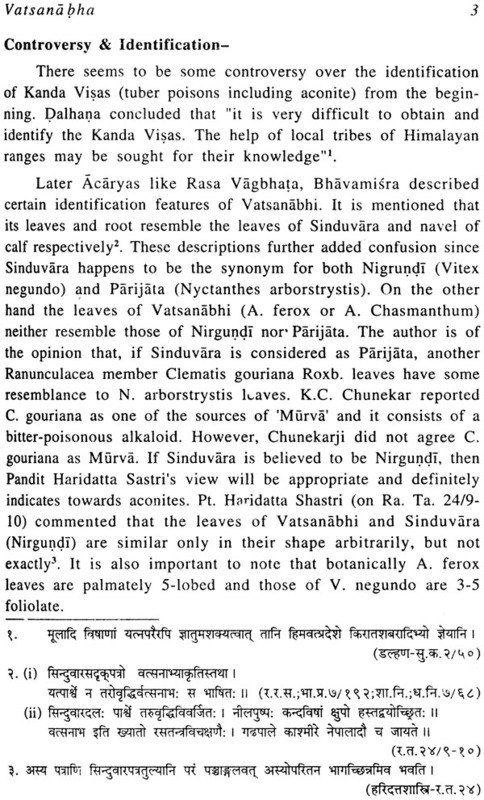 We often come across references about Dravya under Shat padarthas while learning Padartha Vijnana. 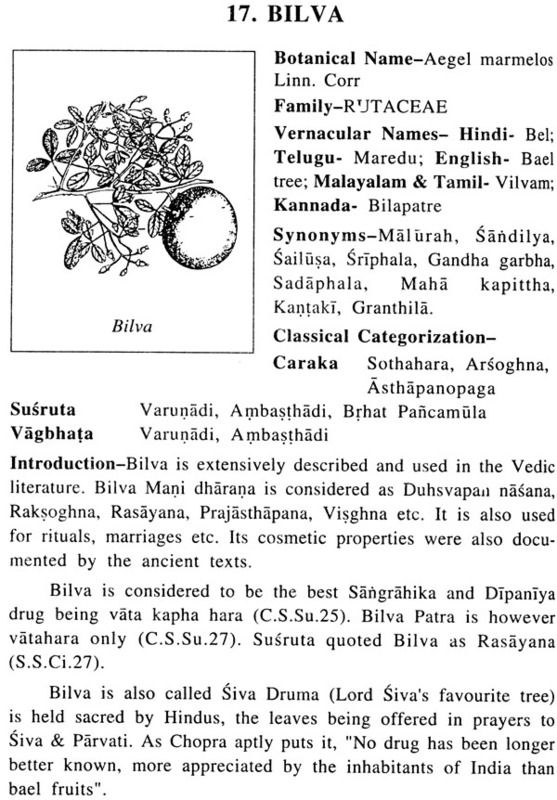 Similarly dravya is an integral part of Dravyaguna Vijnana also. But the former branch deals with the Karana dravya (casual material) and the later branch deals with the Karya dravya (Effectual material). Therefore first branch may be called as ‘materiology’ and second branch as ‘materia medica’. The author is of the opinion that even today Materia Medica is the fittest term to denote Dravyaguna Vijnana. ‘Materia Medica’ (medical matter) is defined as “that branch of science which deals with all drugs used in the treatment of diseases, their source, preparation, dosage and use”. Where as ‘Pharmacology’ is “a treatise on the properties of drugs’. Phamakon = a drug or an active principle and logos = a study. Therefore pharmacology is defined as “the study of drugs, their origin, nature, properties and their effects upon living organisms”. Dravya guna deals with the Karya dravyas like Haritaki, Aswagandha, Guggulu, Vacha etc. 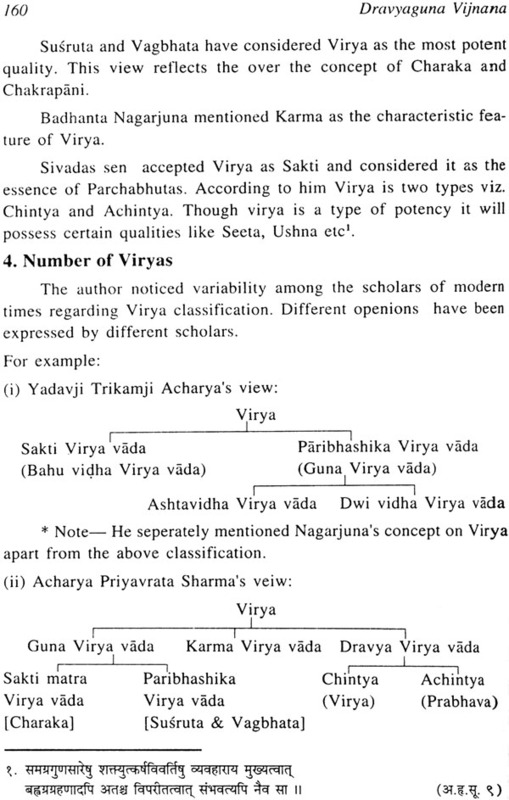 There are seven basic aspects considered in this branch viz., Dravya, Rasa, Guna, Virya, Vipaka, Prabhava &amp;amp;amp; Karma. 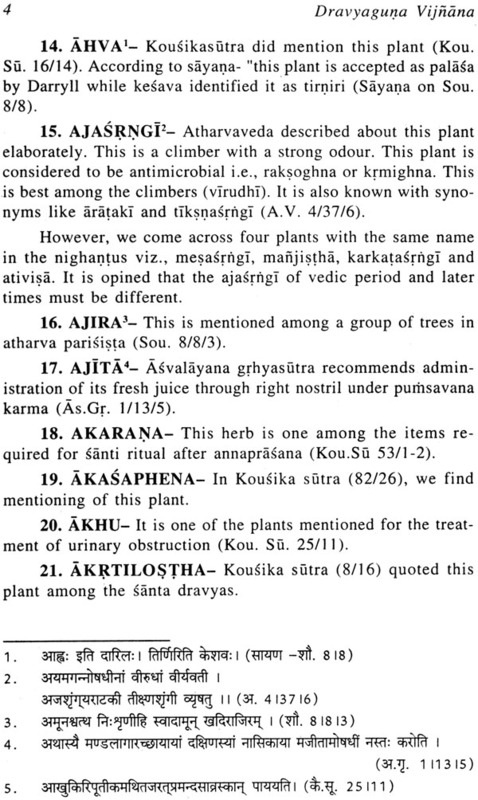 Initially Dravyaguna Sastra was not mentioned as a separate branch of Ayurveda. 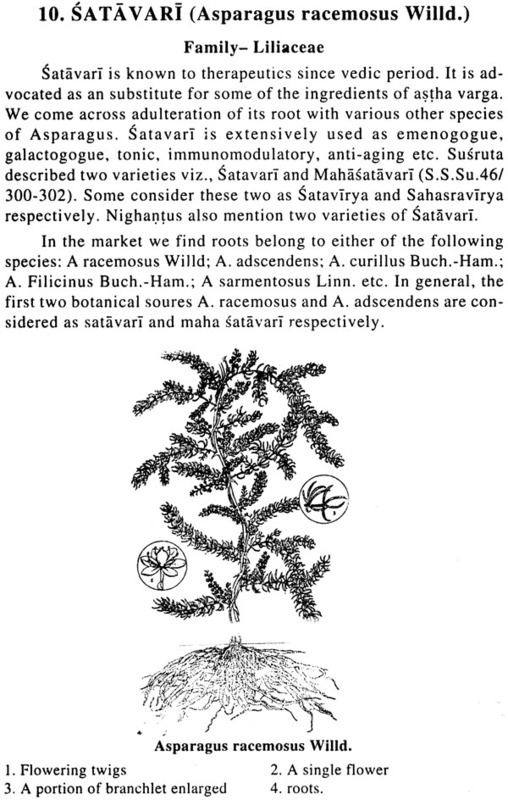 But all the treatises contain elaborate descriptions about the herbs, their properties and indications. It is Raja Nighantu (17 AD) which recognized Dravyaguna as the first branch of Ayurveda. 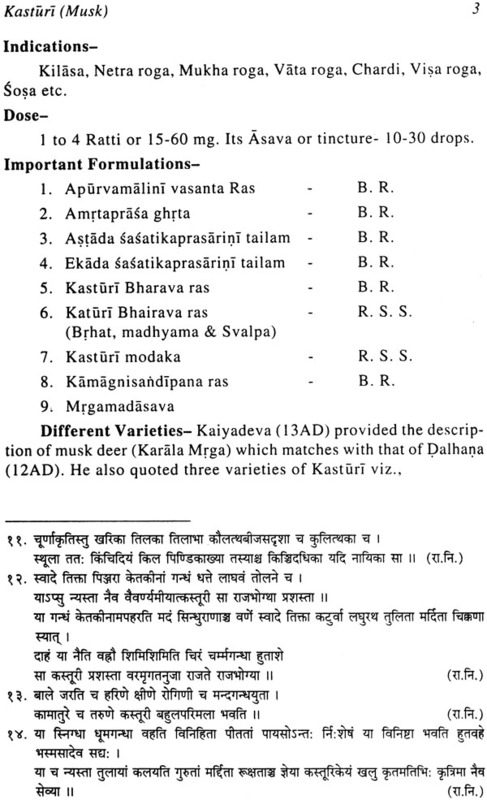 Though Karana dravyas (nine basic factors of creation) do not have a direct role to play in Dravyaguna, they are indirectly showing their importance in the form of chemical constituents of Karya dravyas. Therefore panchabhuta theory is as important as medicinal chemistry. 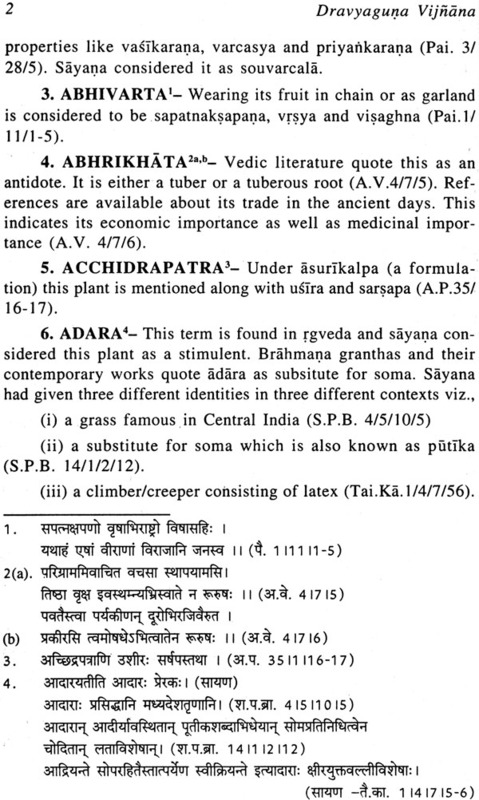 Charaka identified the necessity of complete knowledge on herbs and their utility in therapeutics. He made a simile between poison, weapon, fire and thunderbolts on a par with indiscriminately used drug. On the other hand drug used with perfect knowledge is compared to elixir (Amrita). He also indicated that a deadly poison may be used as medicine if used with logic. Similarly a very good drug may act as deadly poison if used indiscriminately. Further, Charaka documented that the mis-use or abuse of drugs may adversely effect the society by causing Janpadoddhwamsa (mass affect on society). He claimed that using a drug without proper knowledge is a social crime and moral defeat of the conduct of a physician. Such physicians deserve expulsion from the society. It is concluded that chikitsa ultimately depends upon scientific approach. A physician who will utilize the Yukti (logic) and the knowledge of drugs together in practice will become the ultimate authority in the management of diseases. With this background, one should realize the value of the fundamental principles of Ayurveda in general as those of dravyaguna vijnana in specific. 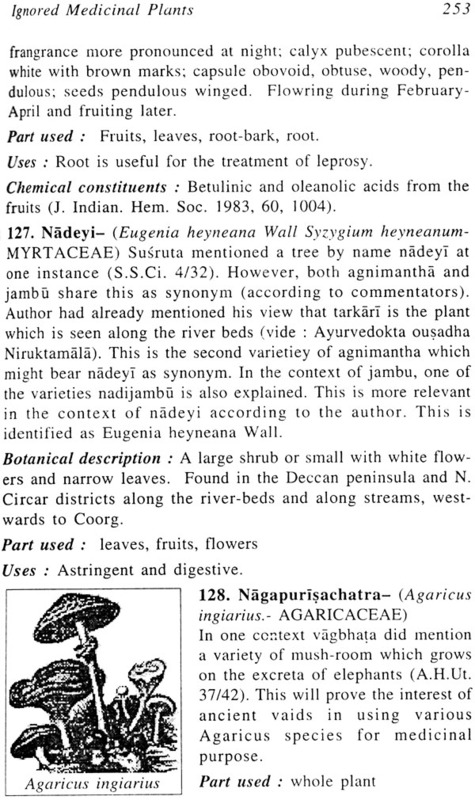 Among the students we find a common expression that dravyaguna is a very dry subject and is not of practical importance. To acquire perfect knowledge on Rasa, Guna, Virya, Vipaka etc., one should know about the Panchabhuta theory. After wards its practical applicability is to be studied. It will be surprising for many to know that still there are some practitioners who practice Ayurveda on the basis of Panchabhutas. A foundation for Panchabhutas is functioning from Sanglitown of Maharashtra. Vaidya Datar Sashtri was the founder who followed Panchabhuta theory in practice and today many of his students are following the same concepts. Exquisite knowledge on fundamentals of dravyaguna is always advised because of their utility in practice. For example, ‘Pandu’ which occurs as Rasa Pradoshaja Vikara as well as Rakta kshayaja vikara requires ‘Soumya’ &amp;amp;amp; ‘Agneya’ dravyas respectively. 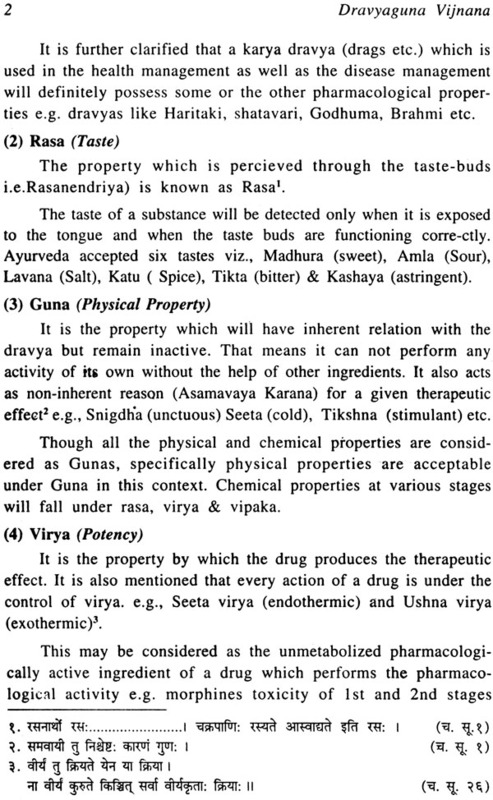 Similarly the Rasayana group of drugs have both Seeta and Ushna Virya dravyas. 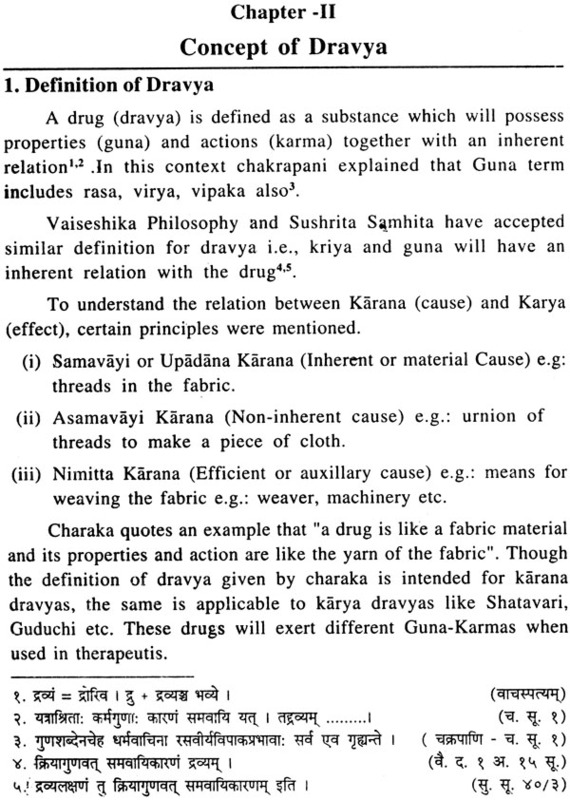 Therefore one should know which dravya is to be prescribed in a given condition. Hence the necessity of fundamental principles of dravyaguna are more emphasized. As a student the author did experience difficulties in compiling these aspects from different texts. 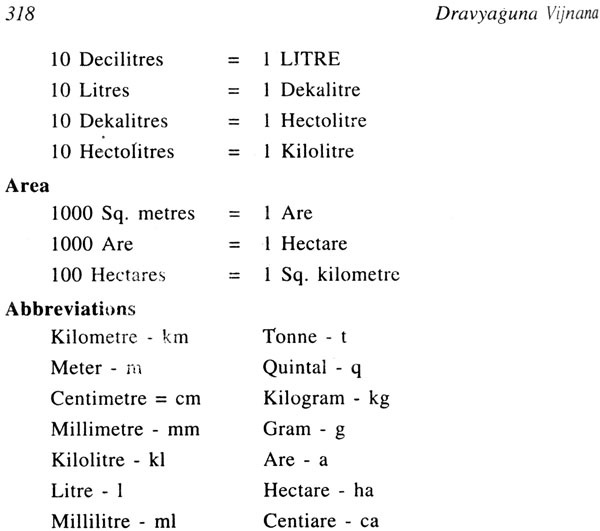 There are good texts on dravyaguna written by scholars like: Yadavji Trikamji, P.V Sharmaji, S.C.Dhyaniji, Viswantha Dwivediji and K. Nisteswar etc in different languages. But there is no complete text in English on dravyaguna in accordance with CCIM syllabus. Earlier some attempts were made by H.V. Savnur and Moss in English. Still a comprehensive English text is in demand. This book mainly covers the first paper of Dravyaguna for B.A.M.S. students as per the CCIM syllabus. There are sixteen (16) topics in the syllabus which are divided into two parts (A&amp;amp;amp;B). Each part will cover eight topics. After careful examination of the syllabus, several repetitions were found by the author. Karma chapter is discussed more elaborately with modern pharmacological actions. Several herbs screened for biological and phar – macological activities are mentioned with relevant references. The history of Dravyaguna and the chapter on Nighantu will be helpful to many. Different Nighantus, their authors along with time and inner matter are discussed elaborately. Overall, the text is meant for every one who is interested to learn about fundamental principles of Dravyaguna in Ayurveda. One can not forget the dictum- “a good physician is a good pharmacologist too”. It clearly indicates that a thorough knowledge in the science of drugs en- genders excellent success in clinical practice to the physician. The author welcome suggestions and corrections from the readers if nay notice. Publishers sri Chaukhamba Orientalia, Varanasi are really appreciated for their relentless efforts on Ayurvedic literature publication. I am indeed happy to write a foreword to the book entitled Dravyaguna vijnana- "principles of pharamcotherapeutics in Ayurveda" written by Dr. J.L.N. Sastry. Dr. Sastry has taken a Herculean task to compile this book in English after referring voluminous literature of past and present in Ayurveda. He has meticulously prepared the text sitting the original references from the textbooks of ayurveda and con- temporary writers. In the introduction he has mentioned the objective of this book is to provide a comprehensive knowledge about the subject "Dravyaguna" prepared in accordance with the CCIM syllabus for undergraduates in Ayurveda. 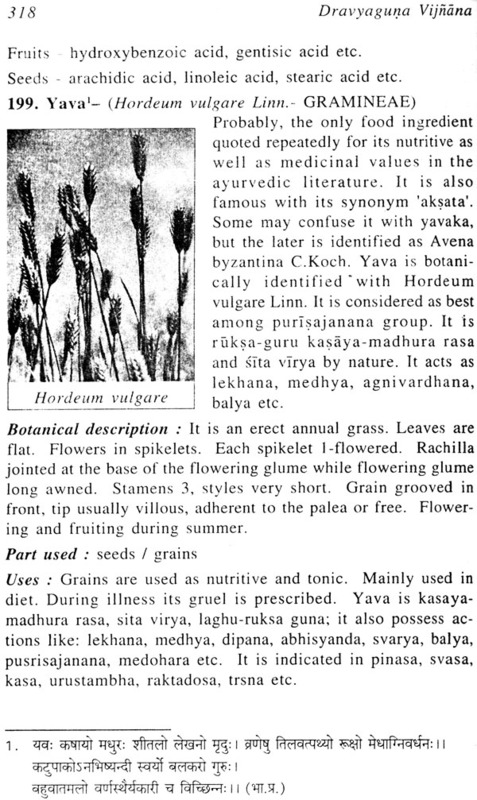 This compendium of dravyaguna vijnana is not totally a substitute for the most referred "Materia medica" of Indian medicinal plants. But this book will be very useful for the students, practitioners and researchers on medicinal plants, both in its contents and structure. The distribution of core subjects into different chapters viz. 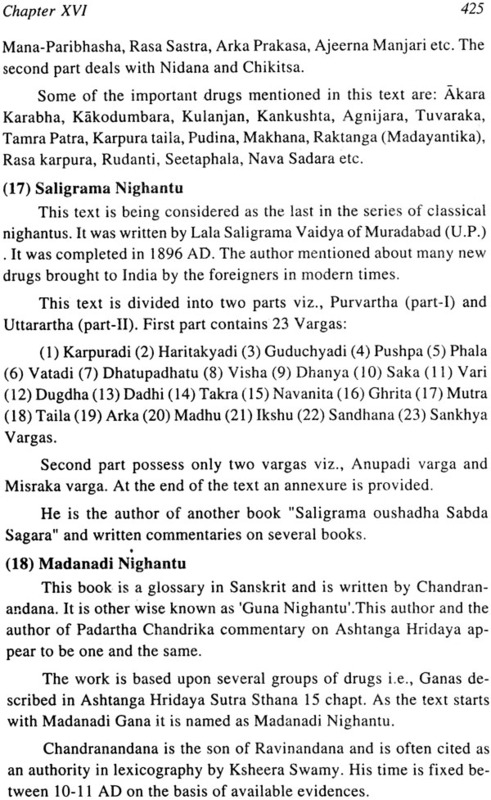 Dravyaguna sasthra, Concept of Drug, Classification of drugs, concept of Karma, Botanical classification of plants, their collection, preservation, parts used in the preparation of medicines, various dispensing forms medicines, administration of drugs, the role of anupanas, brief history of dravyaguna in Vedas and Samhithas, glossary of Nighantus and their authors and an index to references makes this book more informative and easy to use. 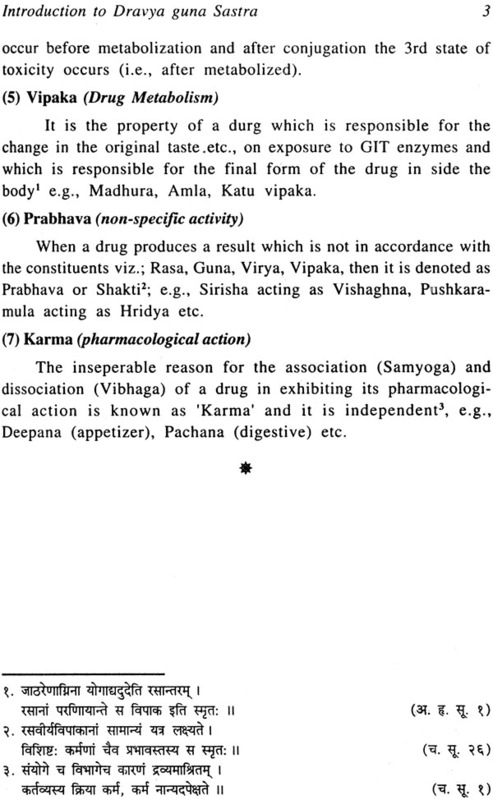 The pharmacological, toxicological and clinical efficacy of a drug are attributed to the five qualities of the drug broadly classified as Rasa, Guna, Veerya, Vipaka and Prabhava. The Physical, Chemical and Physiological properties of dravyas are different to each other so as their Rasa, Guna, Veery a, Vipaka and Prabhava. The pharmacodynamic and pharmacokinetic actions of Ayurvedic single and compound medicinal preparations are difficult to explain in terms of modern Pharmacology. It is not the single chemical entity as in the case of allopathic drugs, acts on a receptor and elicits a response. Moreover, the drug therapy is individualized taking into account of Prakruthi of the individual ~ not generalized as in the case of allopathic drugs. The drug selectivity for a particular disease is further determined by the predominance of Doshas. There is also said to have compatibility of Panchbowthik principles of dravya with that of the individual. The sources of dravyas, occurrence in the nature and their broad classification into Ahara and Oushadha dravyas have been elaborately discussed. The classification of dravyas according to their potency viz. Tikshna, Madhyama and Laghu is an eye opener to modern therapeutics on the rationale of selection of drugs for the treatment of various diseases in the appropriate dispensing and dosage forms. 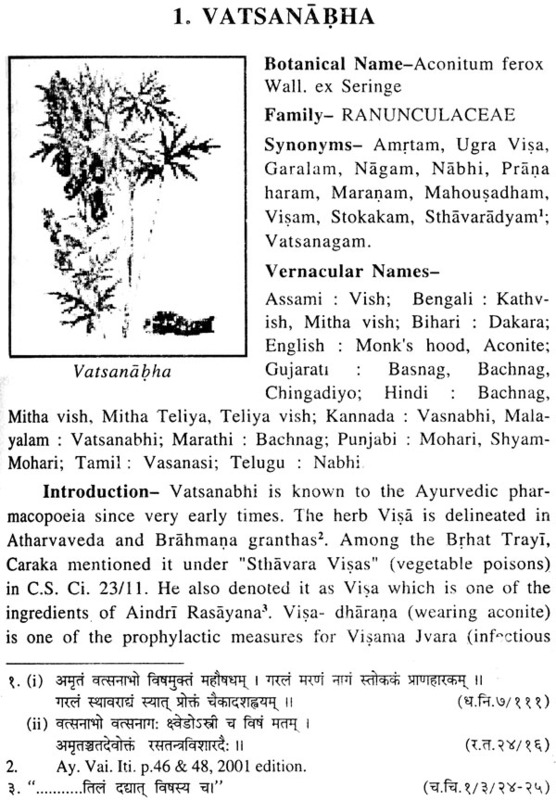 The term veerya, is a confusing terminology with its equivalent term potency in modern pharmacology. The author has made an attempt to classify the 120 main drugs in the CCIM syllabus to the ushna veery a and seethveerya groups. This is an open challenge to the readers to accept it or modify it according to their experience with the drug. Ayurvedic system of medicine has been practiced in the country and elsewhere from time immemorial and has stood the test of many adversities. In this book the auther deals with the pharmacotherapy of Ayurvedic drugs in lucid fashion and it can be seen how some of the new drug regimen have their genesis in the herbarium of ancient Science of life. This book on Dravyaguna vijnana will be a welcome and timely contribution to students, practitioners and researchers of ayurvedic medicines. The purpose of this book will be served only by the progressive suggestions and criticism by the readers and I am sure the readers will be benefited immensely by this book. I wish Dr. Sastry to get more opportunities to write books of this type in English to popularize Ayurveda globally. 1. 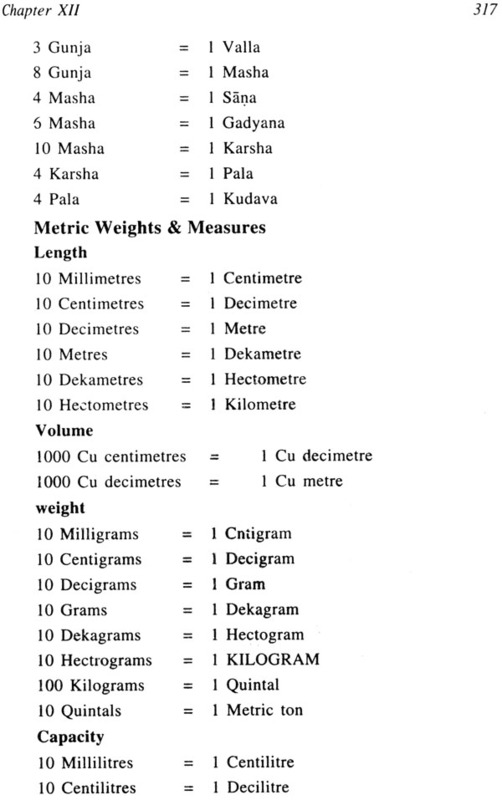 This is the first work published in English and written according to the CCIM syllabus for the subject- Dravyaguna. 2. This work discusses the 122 main herbs in detail, followed by 250 other herbs with introductory part. 3. The herbs are provided with the information right from the Vedic period to the latest, including the current research. 4. All the references about the properties of the herbs are provided as the foot note at the end of the each herb. 5. The controversy about the individual herb is provided as a separate entity, which gives the clarifications regarding botanical identity. 6. Equal emphasis is given to classical literature including Sanskrit references, botanical descriptions, therapeutic utility and scientific studies. 7. Dr. K.C. Chunekarji is kind enough to write the foreword for this work. 8. All the literature available at present is consulted while preparing this work making this more useful to both U.G. as well as P.G. students. 9. To make this work friendly to the students, five annexure are provided in the end. 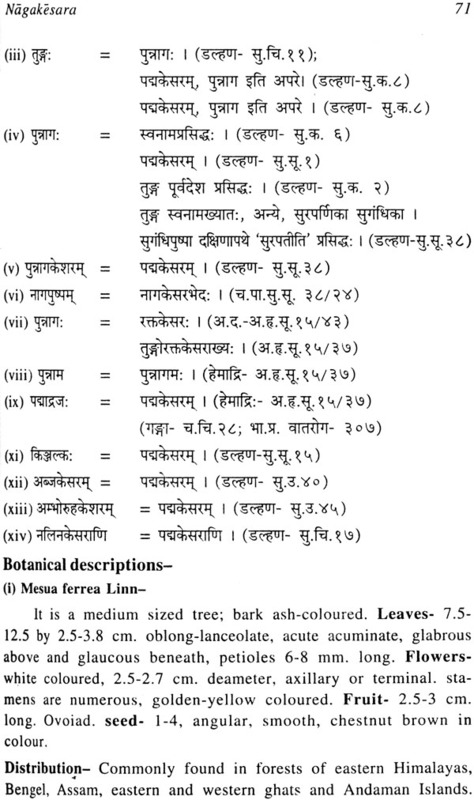 The index is arranged as per the botanical sources alphabets. 10. Students, teachers and practitioners will be benefitted by the exclusive information on several herbs provided in this work. After discussing the Fundamental principles of pharmacotherapeutics in Ayurveda in the first volume of Dravyaguna Vijnana, the author decided to furnish the next book of the same series (Vol. 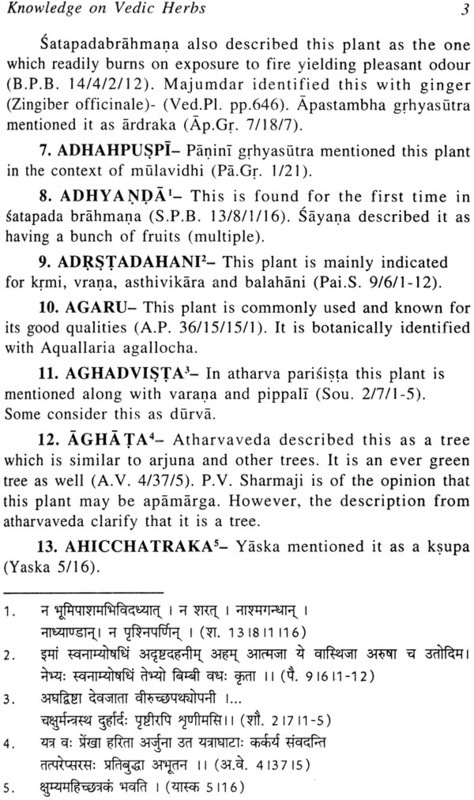 II) entitled – “Study of the essential medicinal plants in Ayurveda”. Human passion on herbal medicine dated back to times immemorial. As we are all aware, the very survival of animal kingdom is dependent of the plant kingdom. The plants/herbs have played major part in the pharmacotherapy during the Vedic period in India. Vedic literature indicates mainly about the utility of single herbs in the management of common diseases. Similar trend is visible during the early Samhita period as well. 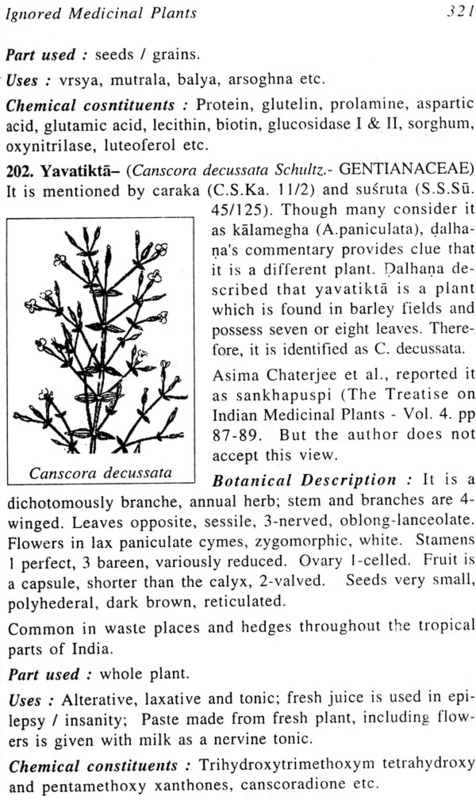 Though certain compound preparations are delineated by Caraka, single herbs with similar indication were categorized under the “Dasemani groups” (i.e., group of 10 herbs with one single indication). Poly- herbal formulations have dominated the Ayurvedic pharmacotherapeutics subsequently. 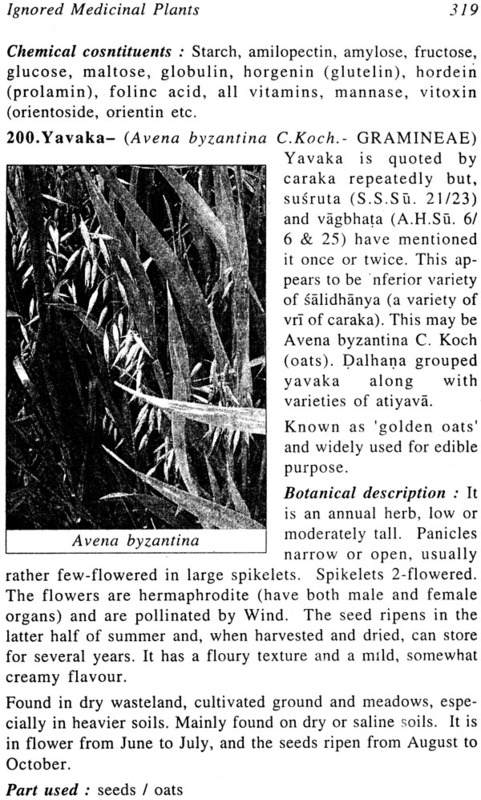 Thence, Susruta mentioned the Ganas (group of herbs) possessing multiple herbs with multiple indications. 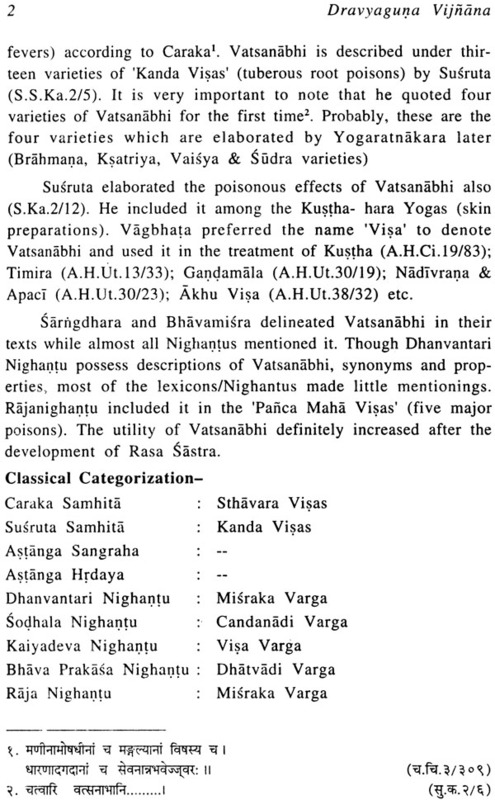 Vrddha Vagbhata tactfully adopted both the earlier approaches. During medieval period, the Laghu Trayi texts and a number of Yoga- granthas were written. In these texts the Acaryas have concentrated upon the complex compound prepartions. In the process, knowledge on the utilization and identity of single herbs is comparatively reduced and several controversies emerged. Respective commentators and lexicographers did try to exclude the controversy by elaborating several synonyms for each herb. However, it resulted in more confusion at later times. The contents of these lexicons remain dormant. Compared to the popularity over the formulations of Yoga- granthas, the knowledge on single herbs is relatively less. For example, formulations like Arogyavardhani rasa, Ananda bhairava rasa, Agnitundi rasa, Pradarataka rasa etc., are more familiar. A little attention is paid to the commentator’s views on single herbs resulting in wrong selection of herbs in the practice. 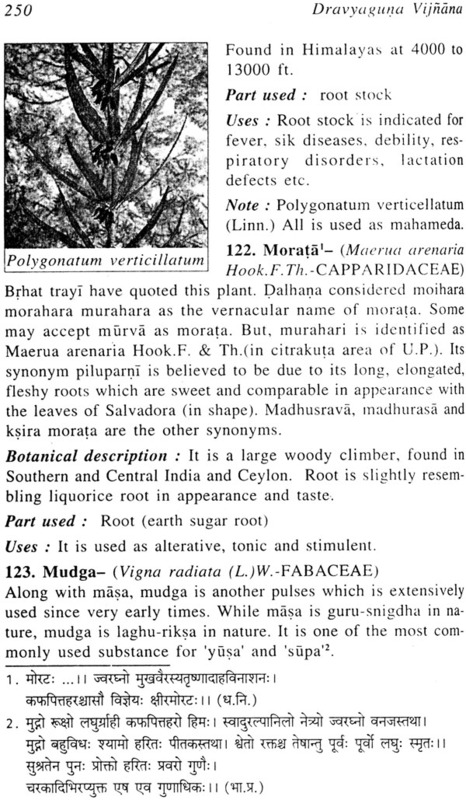 For example, Virataru in Viratarvadi- gana is not Virataru of BAMS syllabus, but it is said to be Usira or Bhallataka according to Adhamalla. Similarly, Sitajit in diabetes shall be used only with Salasaradi Kasaya and only once in the morning according to Dalhana. The importance of herbs especially medicinal plants is identified in the modern times by many scholars and scientists. It will be surprising for many to notice that number of scientific studies conducted on medicinal plants / herbals by the scientists of other faculties (botanists, chemists, pharmacologists &amp;amp;amp; modern doctors) is 80-90% compared to 10-20% contribution by ISM doctors. The literature available on medicinal plants at present may be divided into two categories viz., Classical and Modern. Several Ayurvedic scholars and scientists published rich literature during the 20th century but they were mainly reviewing the ancient literature than scientific works. Coming to the modern literature on medicinal plants, Ansle’s Materia Medica of Hindusthan (1813) is considered to be one the oldest book on medicinal plants in the modern times. Uday Chand Dutta (1870) had written a book entitled - “Materia Medica of Hindus”. Flora of India by Roxbrugh (1874) and Bombay Drugs by Sakharam Arjun (1879) are the books on this subject. During British rule, a drug committee was appointed with the late Dr. Kanny Lal Dey as joint President at the medical Congress held at Kolkata in 1894. On its recommendations, the govt. of India appointed a commission with the object of considering “the desirability of extending the uses of indigenous drugs of India”. Dymock, Warden &amp;amp;amp; David Hooper have published their work “Pharmacogrphia Indica” in 1908. George Watt produced his voluminous work “Dictionary of economic Products of India” (1908) consisting of many medicinal raw materials as well. Almost during the same time Nadkarni K.M. 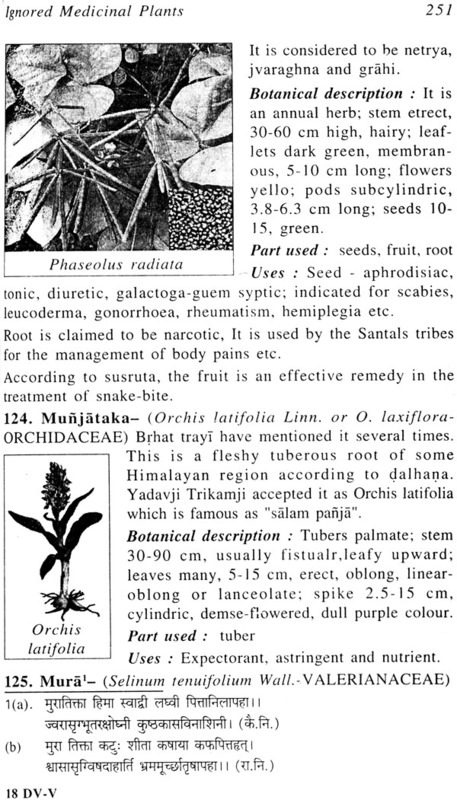 (1908) published his work “Indian Materia Medica” followed by the mega work of Kirtikar &amp;amp;amp; Basu (1918)- “Indian Medicinal Plants” (4 volumes with illustrations). It is a great pleasure and honour to write the Foreword of the .lustrated book entitled Dravyaguna Vijnana Vol. II. in English by Dr. J.L.N. Sastry, a renowned physician and a versatile scholar of Ayurveda. 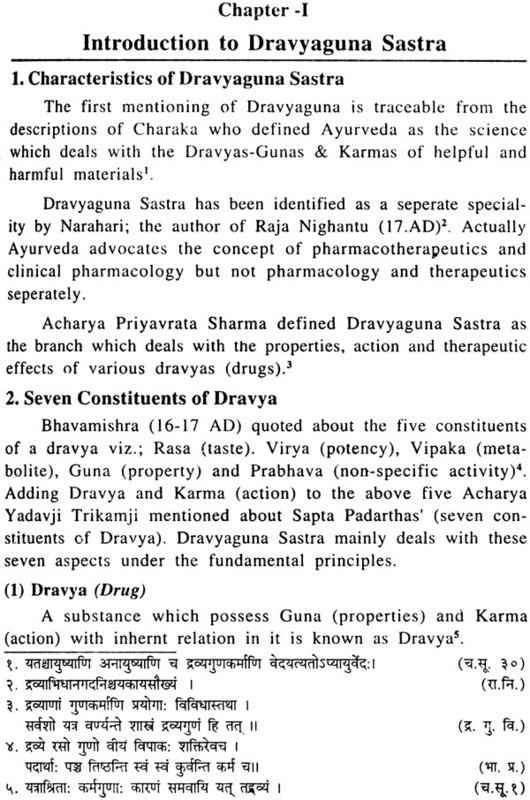 Dravyaguna is the basic subject of Ayurveda though not enumerated in Astanga Ayurveda i.e. having eight broad branches. Dravyaguna may be called as the Materia Medica of Ayurveda which includes Pharmacology, Pharmacotherapeutics and Pharmacognosy. The subject was taught in Guru- Sisya Pararnpara, totally as a practical one and hence it was not discussed as a separate subject in the prehistoric age. Later many books were written and the latest classical book is Bhava Prakasa Nighantu of 16th Cent. A.D. in Sanskrit. Many translations and commentaries of it are available in Hindi as well as in other Indian languages, some of which are of very high standard. But none fulfilled the essential subject which could be used as a syllabus based text-book, particularly when a compulsory uniform standard course of studies was layed for B.A.M.S. degree course by the governing body, CCIM for the whole country. The present series by Dr. Sastri seems to be the best in English language. The first volume dealing with the fundamentals was published in 2002 A.D. and is well honoured by scholars allover the country. The present volume II deals with Drugs. 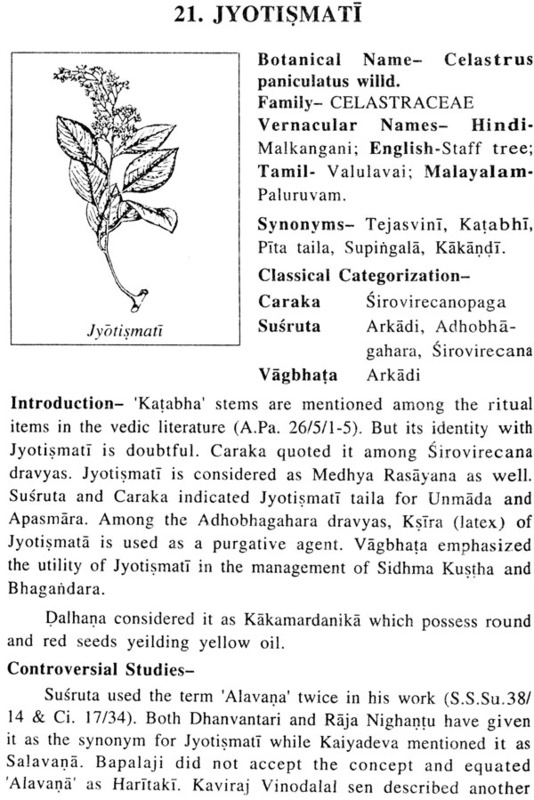 The author has included all the relevant Sanskrit Slokas and other original references to supplement the text which has made this work not only suitable for the degree course but it will be well utilized by re- search scholars, teachers of Ayurveda as well as by scholars of other disciplines like modern medical sciences, Biology, Indology and all those who are interested in herbals. 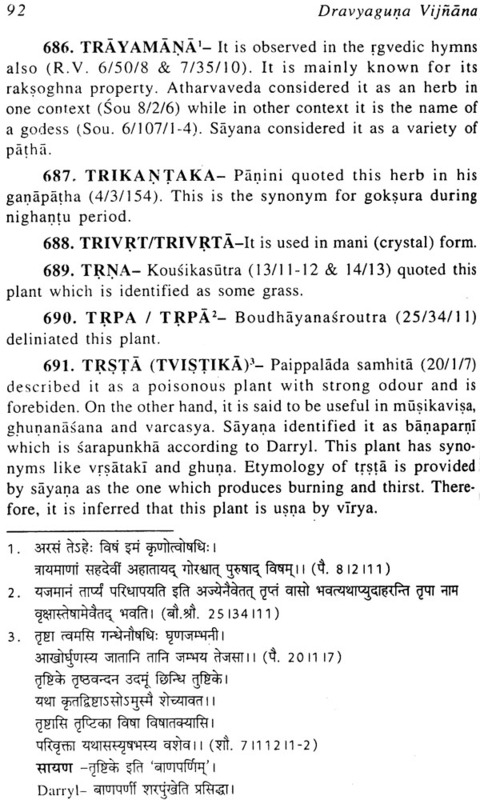 The author having a deep knowledge of Sanskrit has also discussed the identity of the so called Controversial Drugs, having many plant species for-one particular Ayurvedic name, along with new evidences and etymology. Though his views may not be acceptable to other scholars but, no doubt, this will create an impetus to think over new ideas to solve this problem of the whole country having different regional traditions. The utility of these Substitutes or the so-called Adulterants of the group of Controversial Drugs cannot be denied if used after proper scrutiny as advocated by Caraka. These will increase our strength of Materia Medica and conserve the herbal wealth of our country which is under threat due to global verbalization in every field. The author is well justified when he quotes- "a good physician is a good pharmacologist too" and I hope he will publish many more books in near future to fulfill the global demands. The publishers, "Chaukhamba Orientalia" deserve congratulations to publish the book in a attractive outlook with good photo- graphs. 1. This book deals with the important animal products and foods prescribed in Ayurvedic material media. The modern perspective of the respective drugs and foods is also provided. 2. Emphasis on the need of animal products like Kasturi (musk), Puti (civet), Agnijara (amber) etc is laid while expressing the need for careful collection methods without sacrificing any animal. 3. 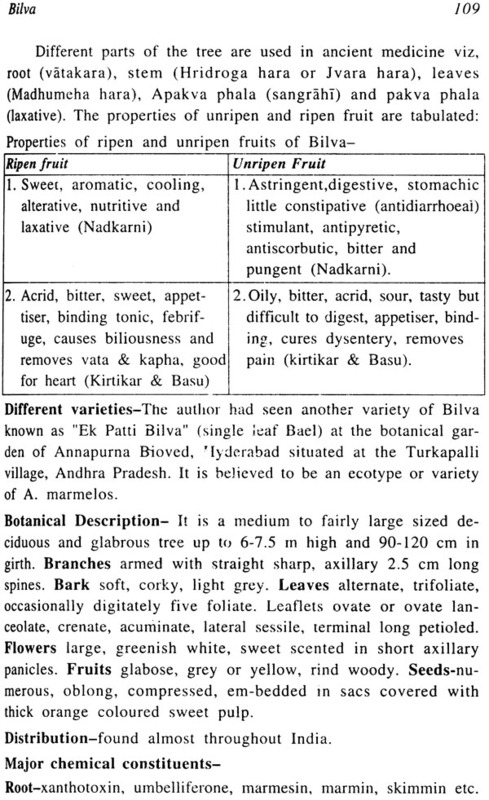 The scientific background for the classification of foods in the ancient Ayurvedic texts is substantiated with the support of modern literature. The nutritive values of these foods are also provided on the basis of available information. 4. This work also deals with the indigenous methods of food processing in ancient India. Various puddings and their role in the management of health and disease are emphasized. 5. 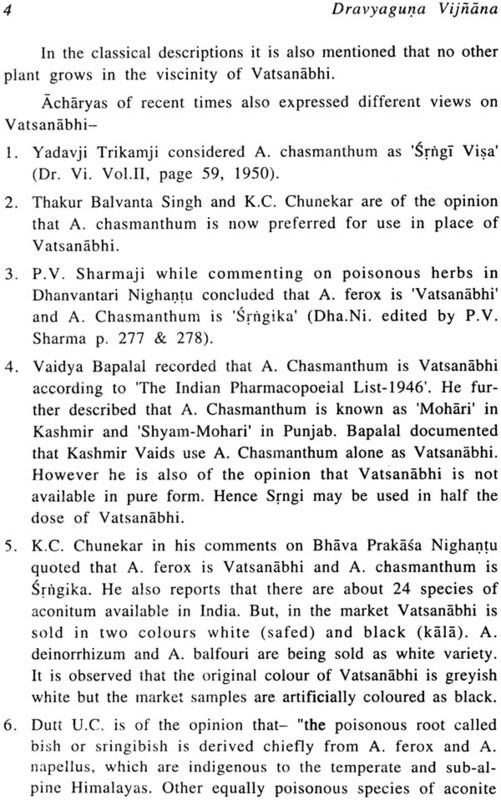 Pharmacognostic identification of some important medicinal plants (12 plants) as described in the CCIM syllabus was also included. This will enable the students of Ayurveda to learn about the easier methods of identification of herbs. 6. It may be concluded that this is the first English work on Dravyaguna which is in accordance with the CCIM syllabus. The author lucidly presented the “Fundamental principles of pharmacotherapeutics in Ayurveda” (Dravyaguna Vijnana Vol.I) and “Knowledge on essential herbs in Ayurveda” (Dravyaguna Vijnana Vol. II). While, Vol. I covers paper- I of BAMS syllabus, Vol. II covers only part-A of paper – II. 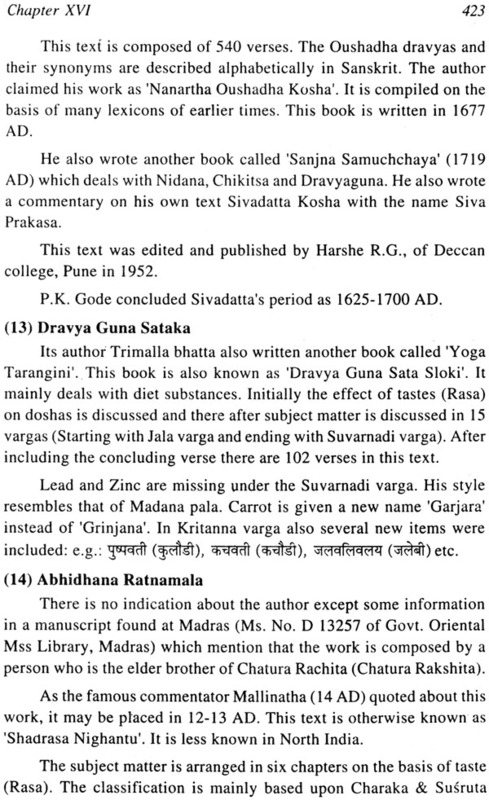 Identifying the need for complete work on Dravyaguna subject, the author decided to complete the paper- II syllabus through the Dravyaguna Vijnana Vol. III. This volume mainly covers the “drugs of animal origin” and “foods recommended in Ayurveda”. This work also covers the pharmacog-nostic studies of 10 herbs prescribed in the syllabus. 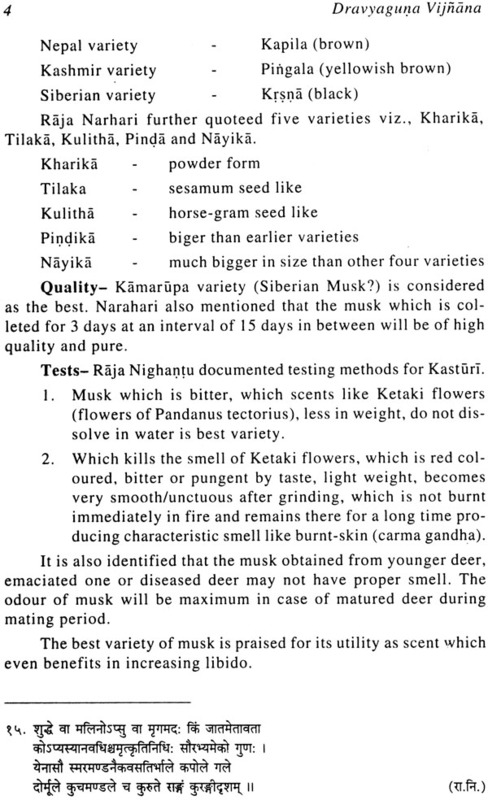 During the study of animal drugs, author did come across difficulty in identifying the first work which introduced drugs like Kasturi (musk), Agnijara (amber) etc. Author did try to provide extensive knowledge on these drugs through review of ancient literature and scientific information. 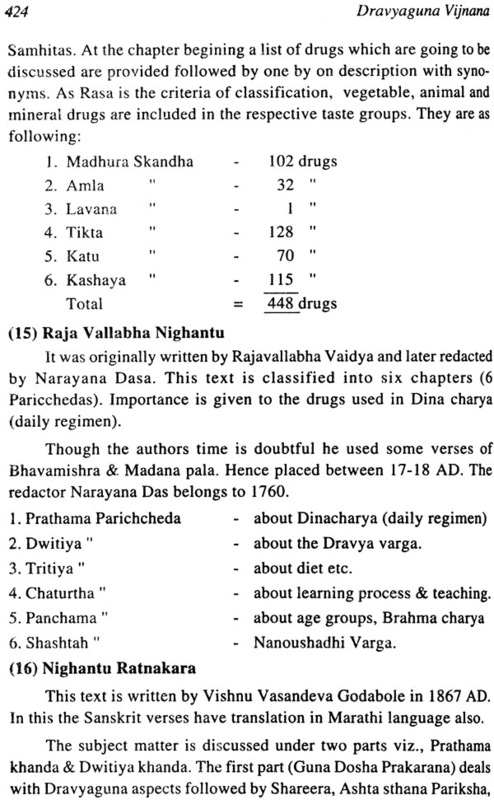 Various Nighantus and Rasa Sastra texts were consulted to provide precise knowledge about the Jangama Dravyas (animal drugs). Another interesting finding in that BAMS syllabus/ CCIM is not following the classical approach towards classification of Jangama dravyas. For example, Caraka quoted – MADHUNI GORASAH PITTAM………..as Jangama dravyas. This approach is totally negleeted in the syllabus and topics like ‘Anga Rasa’ (tissue extracts?) are introduced. Author personally opines that this is not integration. It will be very difficult to understand why there is repitition of some Rasa Sastra topics? e.g. Agnijara, Sankha, Varata, Mukta, Sukti, Pravala etc. 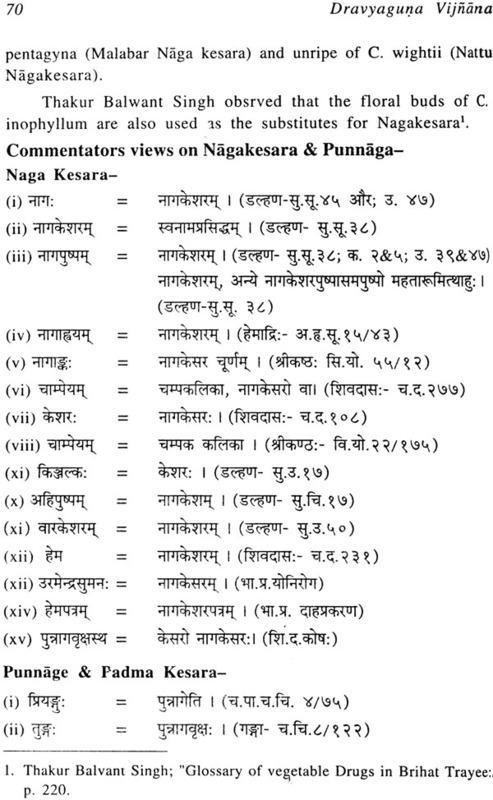 They are already covered under Rasa Satra but also included in Dravyaguna syllabus. Such repititions should be avoided in future. Most disheartening issue is poor knowledge on drugs like Kasturi, Agnijara, Gorocana and Puti. Not even a single P.G. thesis is produced on any of these topics during the past 50 years. 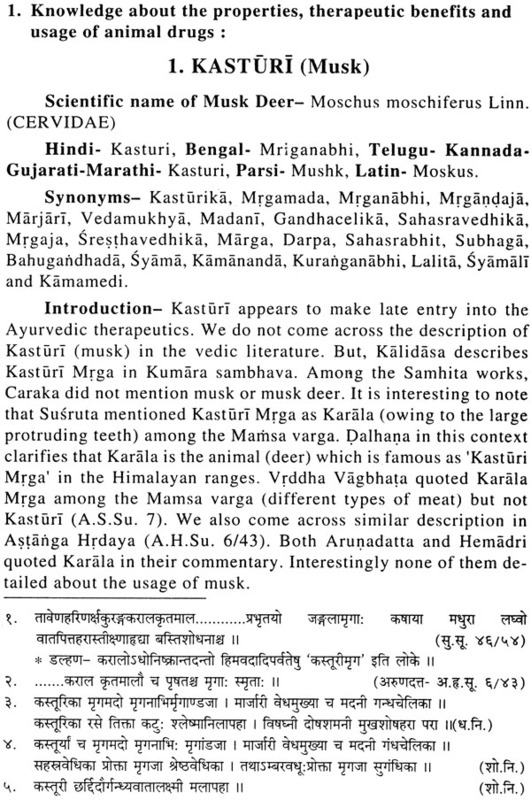 Only consolation is the monograph on Kasturi by CCRAS. 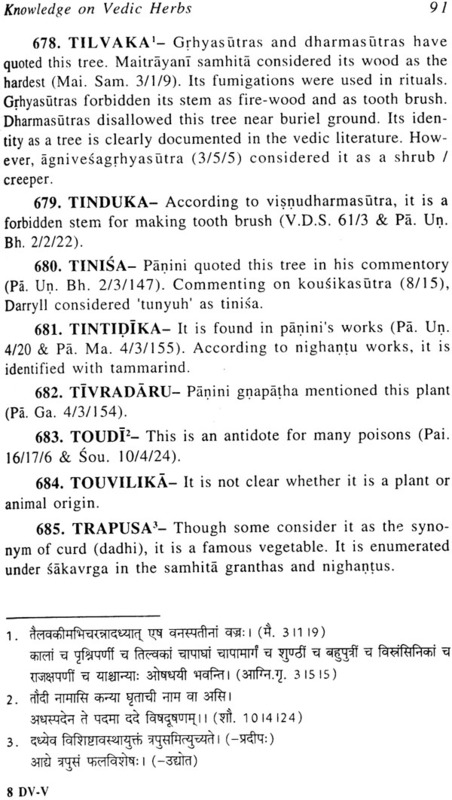 In the context of Agnijara, we find a specific indication ‘Dhanustambha’ (tetanus). If studied scientifically, this may be a oral medicine for tetanus infection. In the recent times Govt. 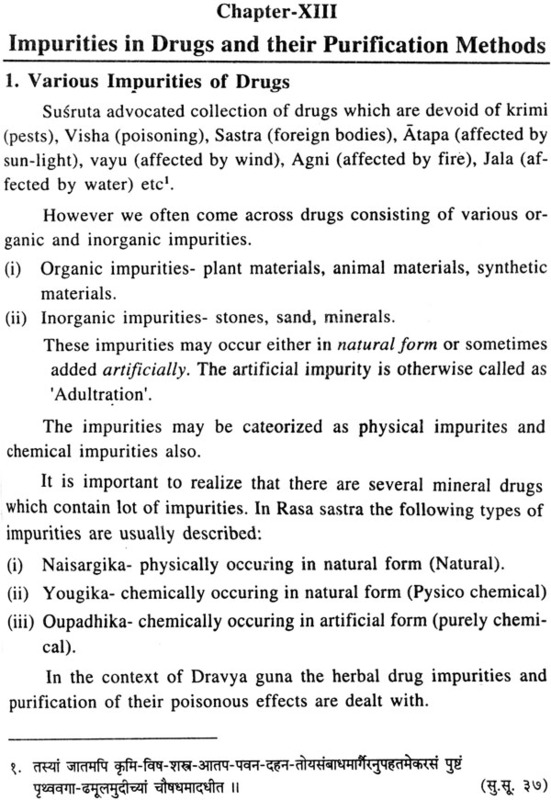 of India banned most of the animal drugs like Pravala (corals), Agnijara (amber), Kasturi (must) etc. The whole Ayurvedic community should now work on modalities to breed/ culture these animal drugs. At least the suitable subititutes must be identified so that both academia and industry are benefited. It is heartening to find place for 12 Ahara vargas with more or less classcal approach in the syllabus. If properly understood and propagated, many of these foods mentioned in the ancient literature will be useful in nutritional disorders. Ayurvedic approach of Santarpana and Apatarpana exactly covers the needs of nutritional disorders like obesity as well as malnutrition. In the end, the pharmocognostic studies on some of the herbs will provide the methods for identification of herbal drugs. This will be every useful for the ameture students, who are keen to know about drug identification. Over all, this work will cover the needs of BAMS students who will be studying Dravyaguna subject. This work will also help the teachers and practitioners to obtain extensive information on Jantava dravyas etc. Finally, the author would like to thank Dr. K.S. Jayashree who provided ‘Foreword’ for this volume. The author also extends his regards to the publishers who are continuously making efforts to bring out texts for the benefit of students. It is may pleasure to write foreword for Dravyaguna Vijanan Vol. III written by Dr. Sastry. Yet again the author brought out another volume to benefit the student community. It is glad to find an elaborate and extensive description of animal and vegetable drugs in this volume. His approach towards the subject is apparent while describing the animal drugs like Kasturi and Puti. He also elaborated all the categories of Ahara dravyas as per the syllabus. Ayurveda imposes self-discipline with regard to the norms of Ahara (food), Nidra (sleep) and Brahmacarya (celibacy). This prevents the risk factors for most of the illness and maintains good health. There- fore, the foods to be consumed and not to be consumed, should be learnt from the ancient knowledge on different food substances. Through the modern concepts of biochemistry, the importance of various food ingredients was analyzed. On the basis of present concepts of Food and Nutrition, the author proves the ancient approach and its scientific validation. This will enable the modern practitioners also to know about Ayurveda. This book is really useful for the Ayurvedic students as well as practitioners to learn about animal drugs, flesh foods and vegetable foods. Since the book provides ancient arid modern knowledge, it will be rewarding if students and practitioners utilize this book. The Central Council for Indian Medicine should recognize all the volumes as reference books for the undergraduate students.
. I once again congratulate the author and the publishers for bringing out a very useful book on Dravyaguna Vijnana. 1. This book deals with the practical knowledge on identification of medicinal plants both microscopically. In other wards it is the practical manual for the students of Dravyaguna. 2. 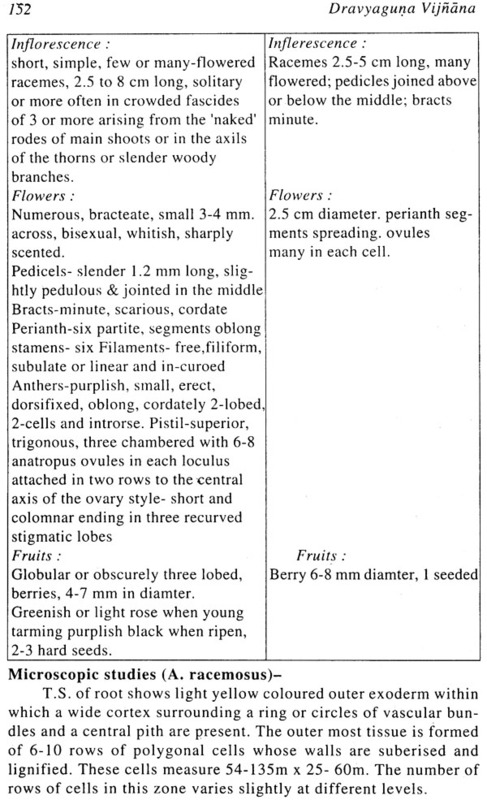 Emphasis is laid on the necessity of basic knowledge on anatomy in botany. 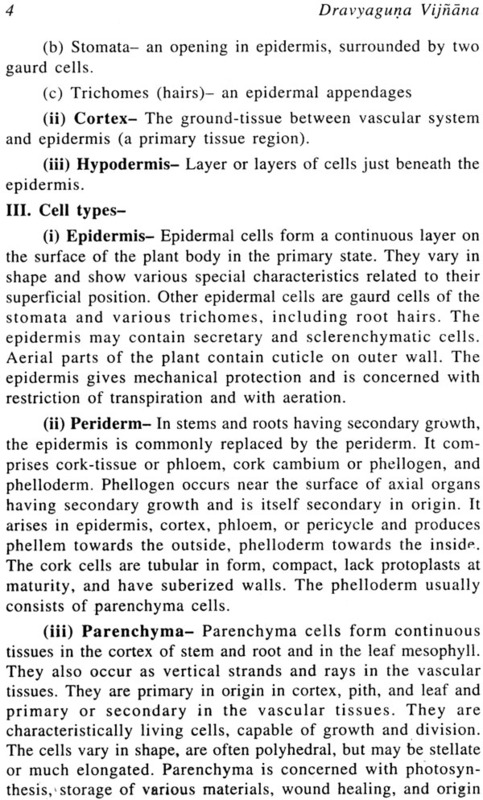 Basic tissues of plants and their characteristics are described in a brief but effective manner. Several illustrations are provided to avoid lengthy descriptions. This will make this work student friendly. 3. 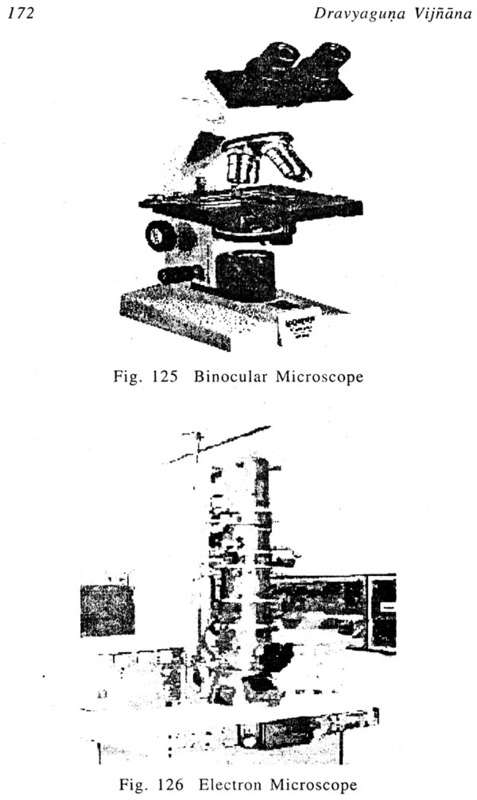 Methods of staining and preparation of slides for microscopic study of various plants is provided with suitable examples as per CCIM syllabus. This will be handy for the teachers of Dravyaguna.while imparting practical training to students. 4. This work also deals with the herbarium preparation and arboretum collections. Both dry sample and wet sample collection of the DG museum is elaborated. 5. 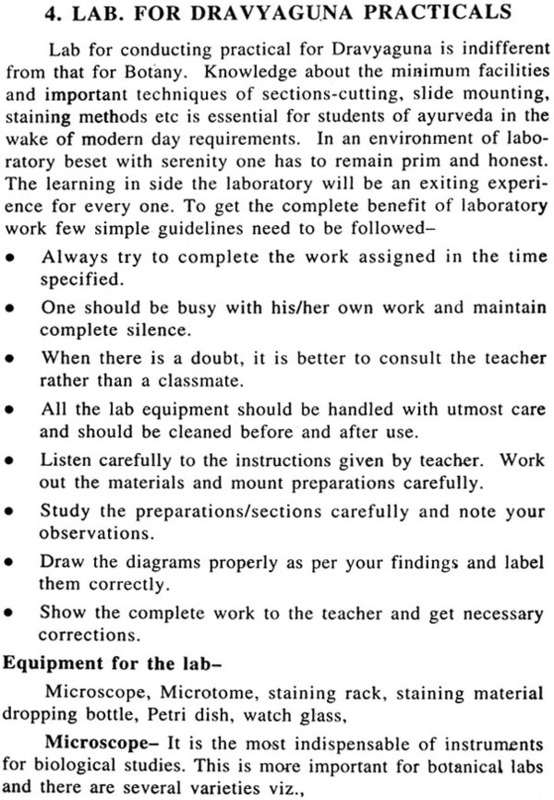 Do’s and dont’s for DG lab along with the necessary tips to the students is special attraction for the students. 6. 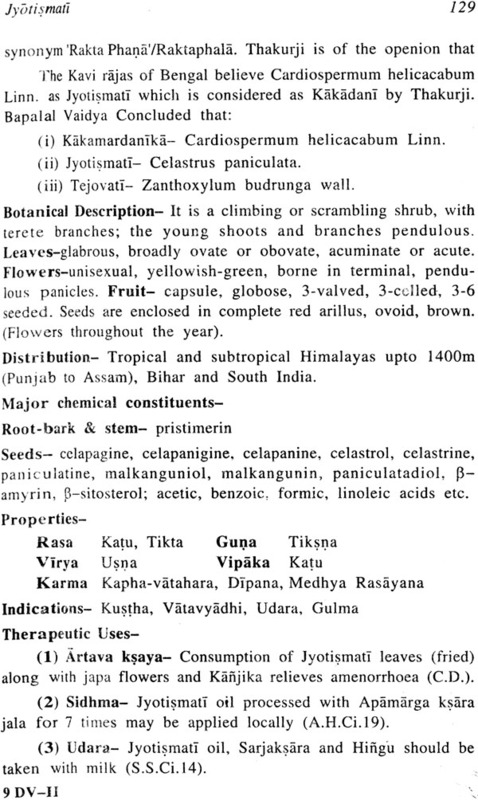 Pharmacognostic Identification of some important medicinal plants (16 plants) as described in the CCIM syllabus was also included. This will enable the students of Ayurveda to learn about the easier methods of identification of herbs through microscopic studies. 7. It may be concluded that this is the first English work on Dravyaguna which is complete and which is in accordance with the CCIM syllabus. After completion of earlier three volumes of Dravyaguna vijnana covering both fundamental as well as applied aspects (in accordance to the CCIm syllabus/ curriculum), author decided to contribute towards practical knowledge about drug identification. Often ayurvedic students find themselves cought in a situation where identity of a herb needs to be established on the spot. If they are trained in simple botanical identity (macroscopic and microscopic), many herbs may be identified without using complex chemical procedures. 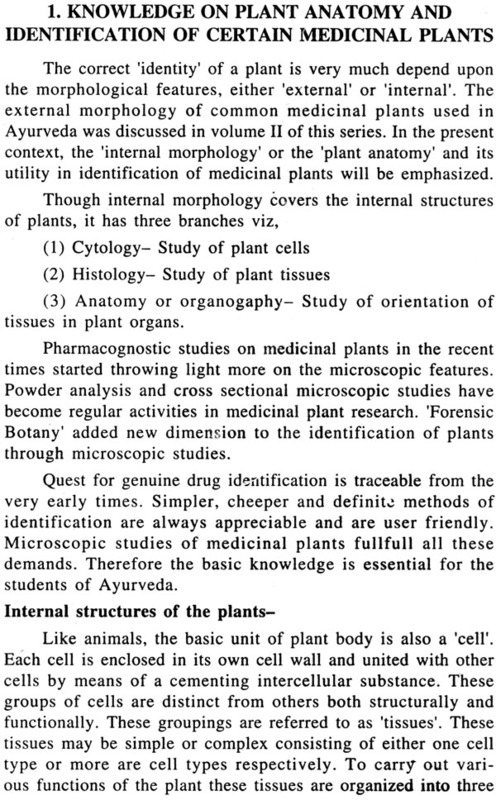 In the present volume “essential knowledge on practical studies for medicinal plant identification” is emphasized using suitable examples. Therefore this fourth volume is entitled as ‘practical training for Dravyaguna students’. 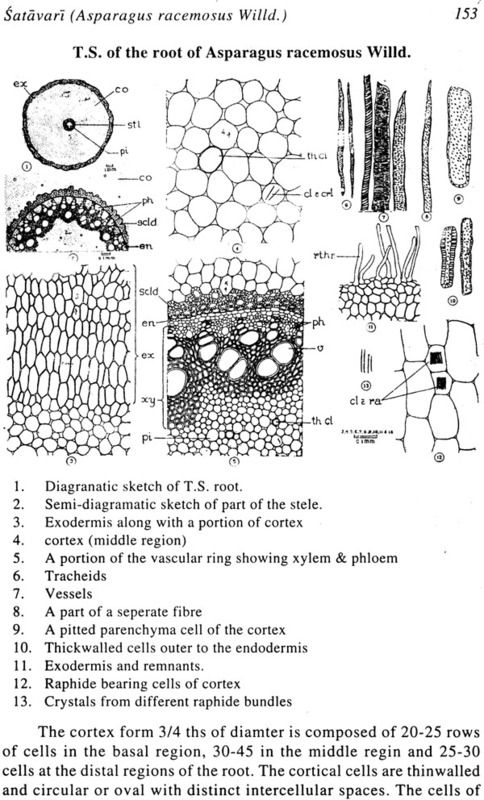 Considering the significance of basic knowledge on botany and plant anatomy, a brief description about different plant cell types and cell structures is provided in this work. The characteristics of each type of tissue and respective identification methods are incorporated. The methods of preparation of transverse and longitudinal sections (T.S. &amp;amp;amp; L.S.) 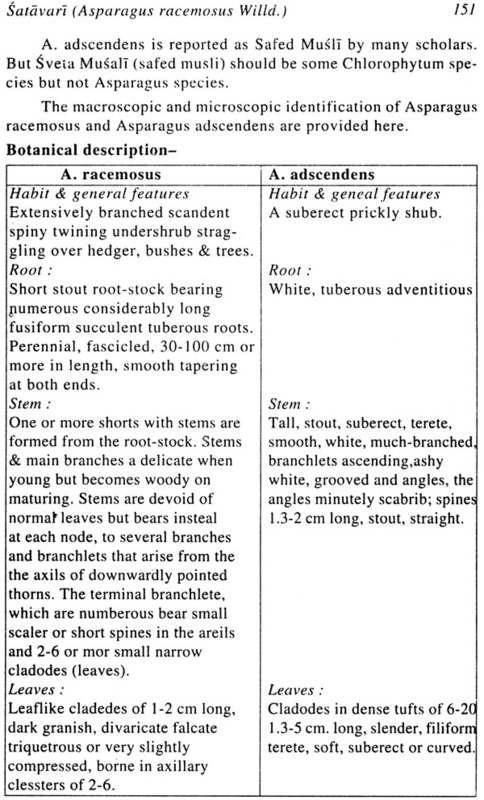 of various plant parts viz., root, stem, leaves etc are elaborated with suitable examples. Various methods of staining and mounting are also provided for the benefit of the students. The whole process of collection of plant material for the preparation of herbarium sheets is explained lucidely. The total procedure from mounting to preservation of herbarium sheets is explained lucidely. The total procedure from mounting to preservation of herbarium sheets is elaborated in this work. This work also covers various methods related to wet sample preservation for the dravyaguna department. This work also deals with the arboretum norms as well. The concept of arboretum (herbal garden) and essential plants for the medicinal plant garden at every institute is emphasized. A list of medicinal plants for the herbal gardens is provided in this work. The above topics comprehensively cover the practical knowledge / training required for the identification of herbs/ medicinal plants. This work will enable the students of dravyaguna tpo compete with pharmacognosists when ever such situation arises. 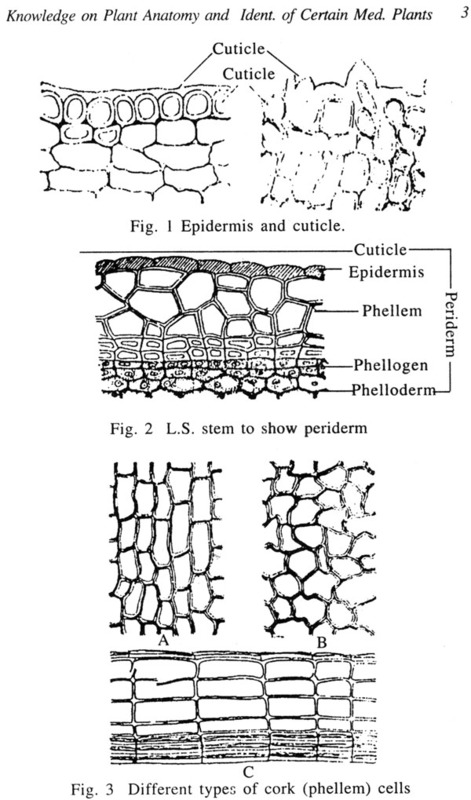 The morphological features of various plant parts are provided through illustrations/ drawings. Different parts of the plant viz., root, stem, leaf, flowers, fruit, seed, resin &amp;amp;amp; bark are described alongwith suitable examples (provided by CCIM). This work will be helpful for the students during the collection of plants for herbarium preparation. Conventionally, it is believed that herbs are identified through organoleptic methods (taste, smell, texture etc). 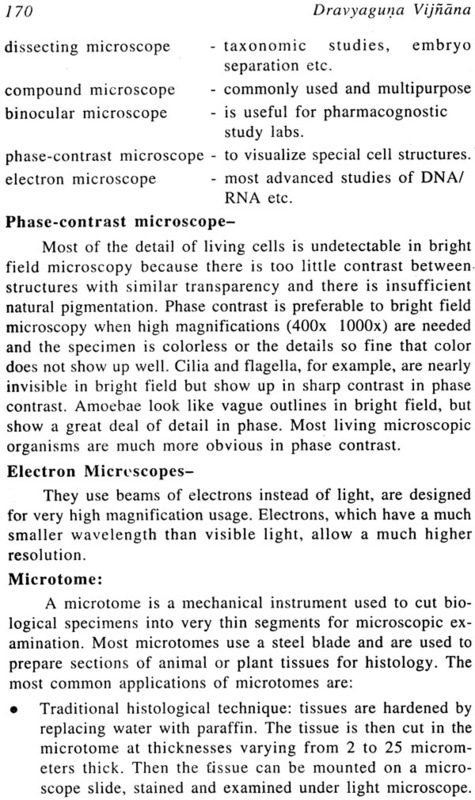 But organized/ systematic macro and microscopic studies will add scientific flavour. This work will benefit both students as well as teachers of dravyaguna. The efforts of the publishers should be appreciated in bringing out this volume. Author conveys special thanks and regards to Dr. Tanuja Nesari for writing the foreword. I am privileged to write the foreword for Dravyaguna Vijnana Vol. IV written by Dr. Sastry. The author in his endeavor to complete the series of Dravyaguna vijnana is bringing out another volume for the utility of students of Ayurveda. He had collected sufficient information regarding the laboratory methods for Dravyaguna practical as per the CCIM syllabus and this work will be handy even for the teachers. Particularly, the descriptions of anatomy (micro as well as macro) covering basic aspects of various tissues are real necessity for students. 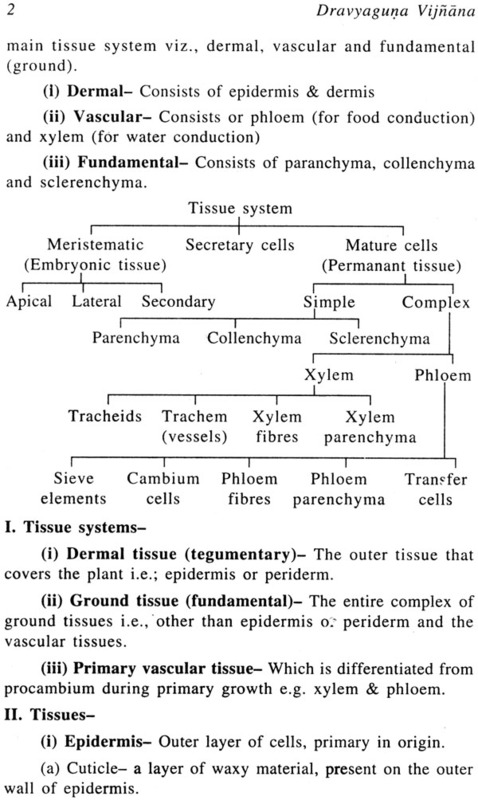 The way in which morphological features are represented through diagrams deserves appreciation. 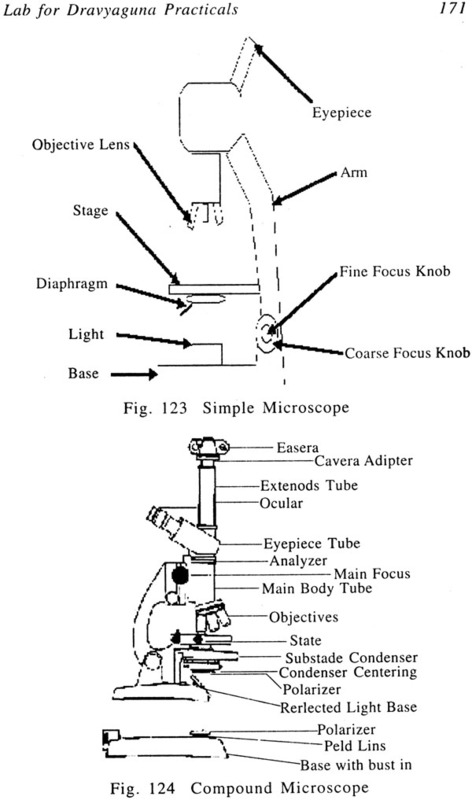 Basic knowledge regarding section cutting, staining, mounting are essential for microscopic studies. Even preparation of herbarium sheets is involved with specific procedures. The plan and plants for arboretum are covered as per the requirements of the syllabus. 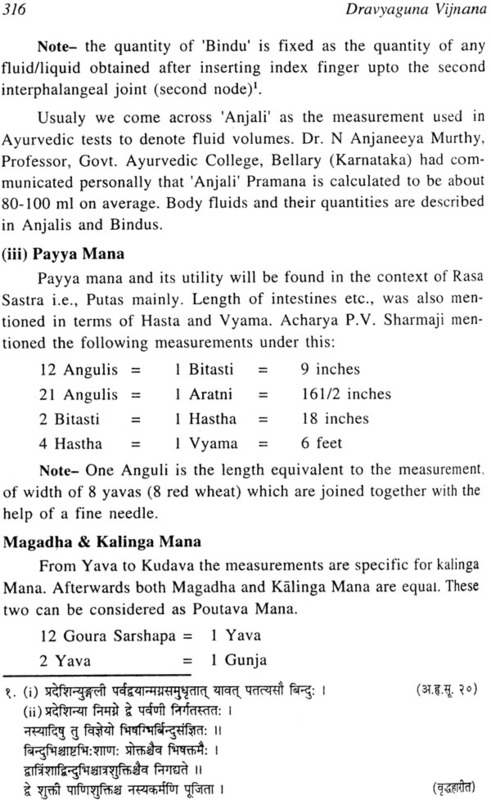 I happen to read the earlier three volumes of Dravyaguna written by the author and personally of the opinion that the 'Central Council for Indian Medicine? (CCIM) should recognize his complete work as one of the references for the undergraduate students of Dravyaguna. I congratulate both the author(s) and the publishers for providing this valuable edition to Dravyaguna Vijnana. Dravyagunavijnanam (DG) is the most important among all the subjects of B.A.M.S. syllabus irrespective of the fact whether it is related to Kayacikitsa (internal medicine) or Salyacikitsa (surgery). For an ayurvedic student, DG is akin to pharmacology and pharmacotherapeutics to an modern medical graduate. Often students of ayurveda feel that they are not imparted with the pharmacology-like knowledge while studying DG during the second professional year of BAMS. My P.G. classmate Dr. J.L.N. Sastry was expressing the similar views during college days (1996-99). Undrstanding the needs of both BAMS and MD (Ayurveda) students he brought an elaborate series of five volumes on DG subject. The first volume covered fundamental principles of DG; the second volume consisted of essential medicinal plants; the third volume covered animal drugs, mineral drugs and foods while the fourth volume provided inputs on DG practicals. After completing the entire syllabus, the author wanted to touch some of the important aspects of DG which were not provided with any place in the syllabus. I am fortunate to provide the foreword for the fifth and final volume of this DG series. In this text author touched some of the very inportan aspects of DG, like vedic herbs, controversial herbs and ignored herbs. Dr. J.L.N. Sastry is known for his keen-observations and dedicated approach. In fact he was the only in –service candidate who got selected on student-merit quota for the PG studies in 1995-96 batch at Hyderabad. He was instrumental in connencting Indian institute of Chemicl Technology (IICT), Hyderabad with the Govt. Ayurvedic College, Hyderabad. When he wanted to work with IICT for the dissertation work on identification of market samples of puskaramula and kustha, many people raised eye-brows and obtaining permission from the college was difficult for him. But, today, it is a regular feature that PG students of Hyderabad work in close association with IICT, Hyd. Dr. Sastry is also known for his fighting qualities. In the present volume he is raising the issue of necessary changes in the CCIM syllabus. May be this work forms the base. Though Dr. Sastry is not involved in direct teaching, he is visiting serveral UG and PG institutes of ayurveda for delivering guest lectures and therefrom, influencing several students. Ever since he joined central services (CGHS) in 1999, he started working on the literature of DG at the advise of his teacher Dr. K. Nishteswar. He started writing the first volume in 1999 and completed it in 2000. This was published by Chukhambha in 2002. The second volume was started in 2002 and completed in 2004. Since then he was busy with new assignment as the Medical Advisor (Ayurveda) of Dabur and Head, Clinical Research of DRF. However in the next three years (2004-07) he completed the third and fortieth volume as decided earlier. The author took about two years to complete this work and consulted various books and scholars. In a span of about a decade he successfully prepared this series in DG covering all the topics of the CCIM syllabus. In fact this is the first complete work on this subject in any language. As a student I did followed ousadhagundadharmashastra (Sanskrit-Marathi) and Ayurvedic Pharamacology & Therapeutic Uses of Medicinal Plants ( Vd. V.M. Gogate –English) apart from Dravyagunavijnana (5 Vol.) of P.V. 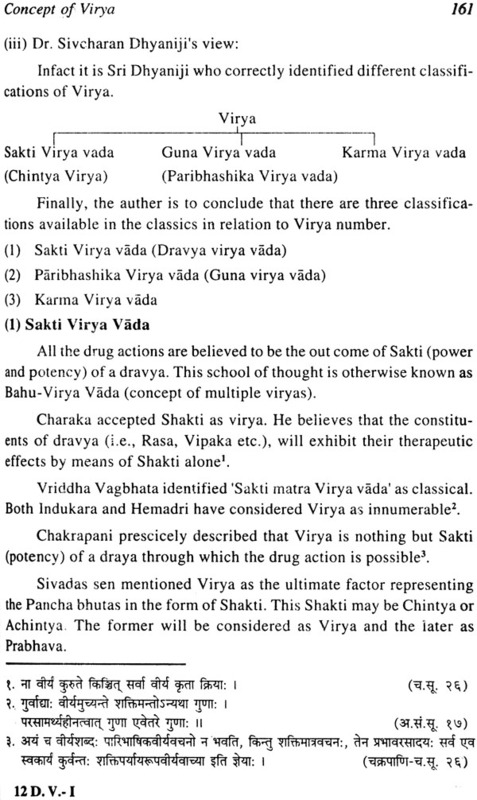 Sharmaji and Dravyagum vijnana (2 vol.) of Yadavji Trikamji. If available at that time, I might have preferred this work of Dr. Sastry. This series will definitely be useful for those who want to understand DG in English. Now as a teacher I can definitely say that this attempt of Dr. Sastry will be appreciated and remembered by all dravyaguna specialists. 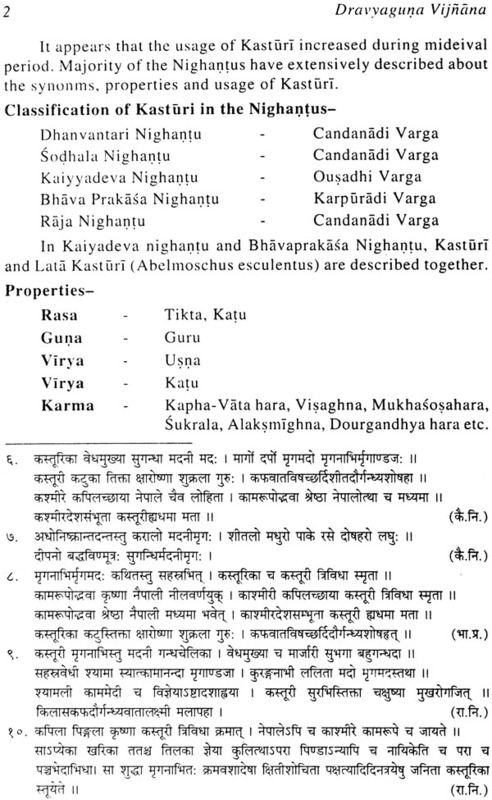 Earlier four volumes of this series covered the dravyaguna syllabus as per the CCIM curriculum. In fact, this is the first time where a complete work is made available in English for the learners of ayurveda. During the process, it is identified that there are few sensitive /important issues which are not taken up y the CCIM while preparing the syllabus. 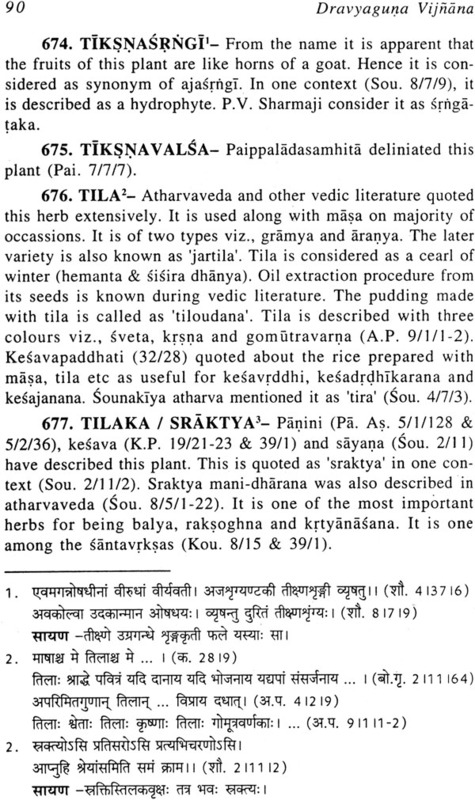 For example, knowledge on vedic herbs, discussion on controversial herbs, important herbs in vogue (but not in syllabus) need special mentioning. 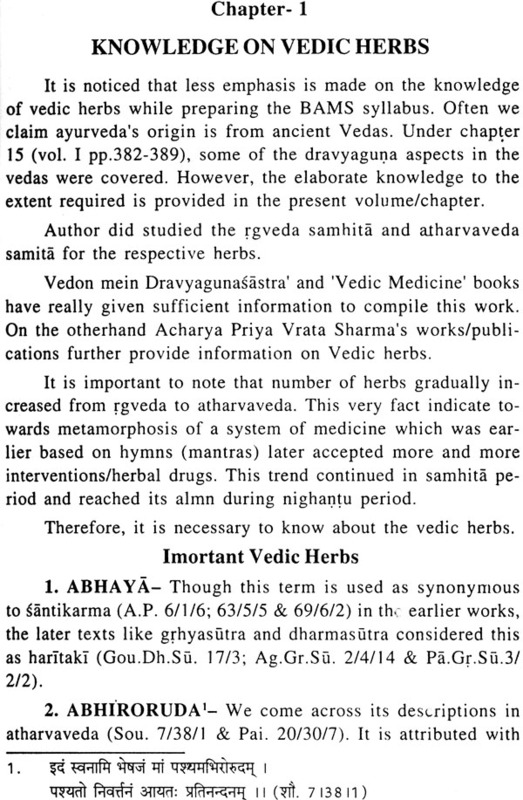 While, preparing notes on second volume, the author realized that the dravyaguna syllabus (on herbs) is not based on the ayurvedic requiraments. The syllabus team might have taken books like Indian Medicinal Plants of Kirtikar & Basu or similr works to prepare the list herbs. 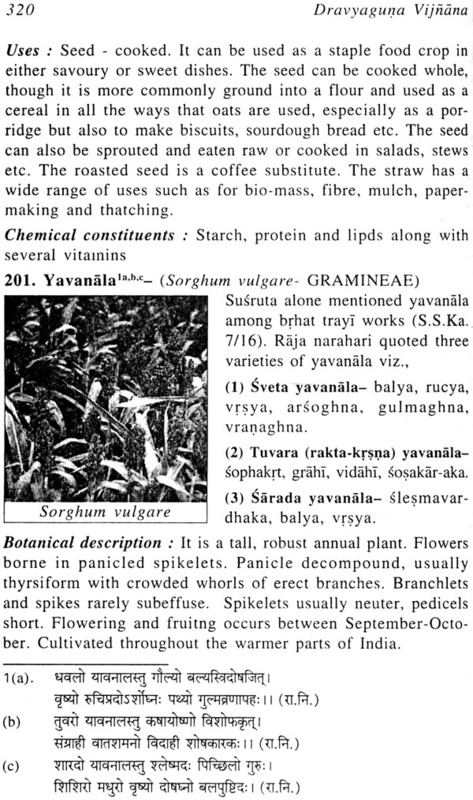 The fact that the first herb in the syllabus, is Vatsanabhi (Aconitum ferox) which belongs to RANUNCULACEAE and the last herb in the syllabus which is chatraka (Agaricus compestris) belongs to AGARICACEAE stands asa proof that they followed botanical classification. Another disheartening aspect of the syllabus is that about 55-60 herbs in the syllabus either belong to Unani or Homoeopathy system while ingonring very important ayurvedic herbs. The missing herbs include: matsyaksi, uttamarini jingini kakajangha, kakanasa, kakamara, vrscikali etc. The main purpose of this volume is to enlighten the teachers and policicy makers of AYUSH to understand that dravyaguna syllabus both at U.G. and P.G. level needs reforms. 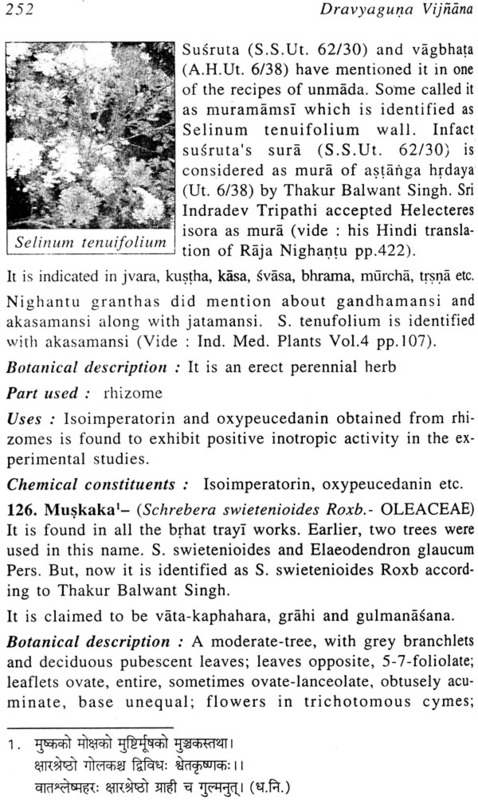 The knowledge in the herbs should serve the purpose of ayurvedic students but not the botanists. At the seme time the author is not against utilization of botany or knowledge of modern science. But, the base should be that of ayurveda. Similarly, drug controversy should also be reduced over a period of time. 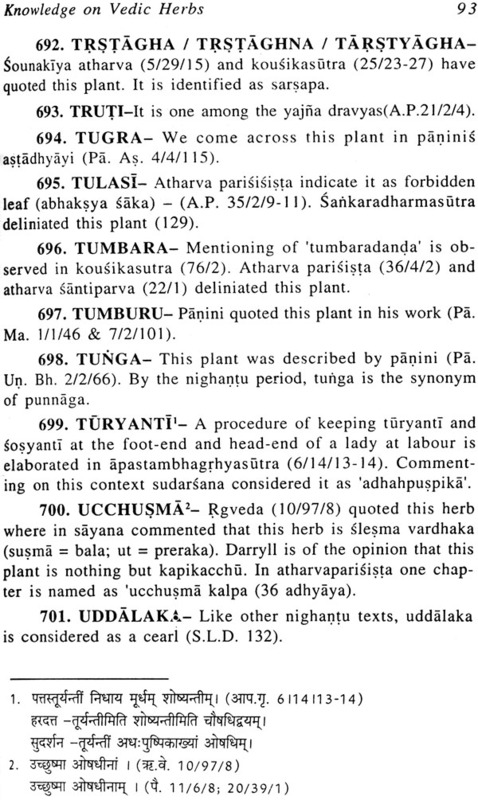 On one occasion, a dravyaguna scholar proposed that “all the controvercial herbs should be removed and then only betterment of ayurveda is possible” for this author replied that –let us remove the ‘controversy’ not the ‘controversial herbs’. This is because, a controversial herb still possess an important pharmacological property. For example, whether chlorophytum sps or Asparagus sps, which ever is used as Safed musli, both have their own therapeutic benefits. If possible, the controversy to be excluded but not the herbs. By removing the controversy we can have two herbs instead of one. If we need to identify three herbs as pasanabbedi (viz;Rotolla aquatic, Aerva lanata& Berginia ligulata), there is no harm. The important factor is that all the three should exhibit lithotriptic property. This volume will definitely enlighten the students and teachers on several important aspects related to vedic herbs, missing herbs and controversial herbs. My Co-scholar and reputed dravyaguna teacher Dr. B.S. Sawant is specially thanked for writing the foreword to this volume. Publishers need special appreciation for their endeour to finish this series successfully.